Stress is all around us, all the time. Whether it’s fighting bad traffic, dealing with pressure at work and home or struggling with unrealistic expectations, we will never be free of stress. The trick therefore is learning how to deal with it in a healthy manner. The body’s response to stress was designed to keep us alive in dangerous situations. It was meant to be a short- term response to get you out of trouble. Modern day life causes people to stay stressed constantly. This results in the adrenal glands releasing excess cortisol, which takes a toll on your health, bringing on premature aging, damaging your immune system and setting the stage for long- term chronic illnesses.Jobs and careers are an important part of our lives. Along with providing a source of income, they help us fulfill our personal aims, build social networks and serve our professions or communities. They are also a major source of emotional stress. Even "dream jobs" have stressful deadlines, performance expectations and other responsibilities. For some, stress is the motivator that ensures things get done. 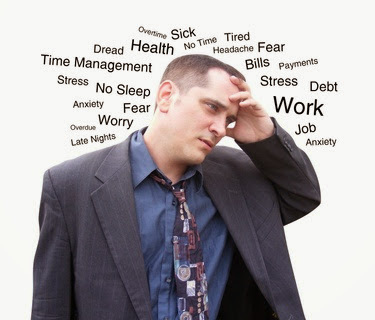 However, workplace stress can easily overwhelm your life. You may continually worry about a particular project, feel unfairly treated by a supervisor or co-workers, or knowingly accept more than you can handle in hopes of earning a promotion. Putting your job ahead of everything else can also affect your personal relationships, compounding the work-related pressures. Layoffs, restructuring or management changes can heighten anxiety about your job security. In fact, a Norwegian study showed that the mere rumor of a factory's closure caused rapid increases in workers' pulse and blood pressure. Research in the U.S. has found that workplace injuries and accidents tend to increase in organizations that are being downsized. Along with its emotional toll, prolonged job-related stress can drastically affect your physical health. Constant preoccupation with job responsibilities often leads to erratic eating habits and not enough exercise, resulting in weight problems, high blood pressure and elevated cholesterol levels. Common job stressors such as perceived low rewards, a hostile work environment and long hours can also accelerate the onset of heart disease, including the likelihood of heart attacks. This is particularly true for blue-collar and manual workers. Studies suggest that because these employees tend to have little control over their work environments, they are more likely to develop cardiovascular disease than those in traditional "white collar" jobs. Your age is also a factor. A University of Utah study found that as stressed workers get older, their blood pressure increases above normal levels. Interestingly, many of the study's over-60 workers reported that they did not feel upset or unduly pressured by their jobs, even though their blood pressure levels were significantly higher. Job stress also frequently causes burnout, a condition marked by emotional exhaustion and negative or cynical attitudes toward others and yourself. Burnout can lead to depression, which, in turn, has been linked to a variety of other health concerns such as heart disease and stroke, obesity and eating disorders, diabetes and some forms of cancer. Chronic depression also reduces your immunity to other types of illnesses, and can even contribute to premature death. Not managing your stress levels can be dangerous. Fortunately, there are many ways to help manage job-related stress. Some programs blend relaxation techniques with nutrition and exercise. Others focus on specific issues such as time management, assertiveness training, and improving social skills.